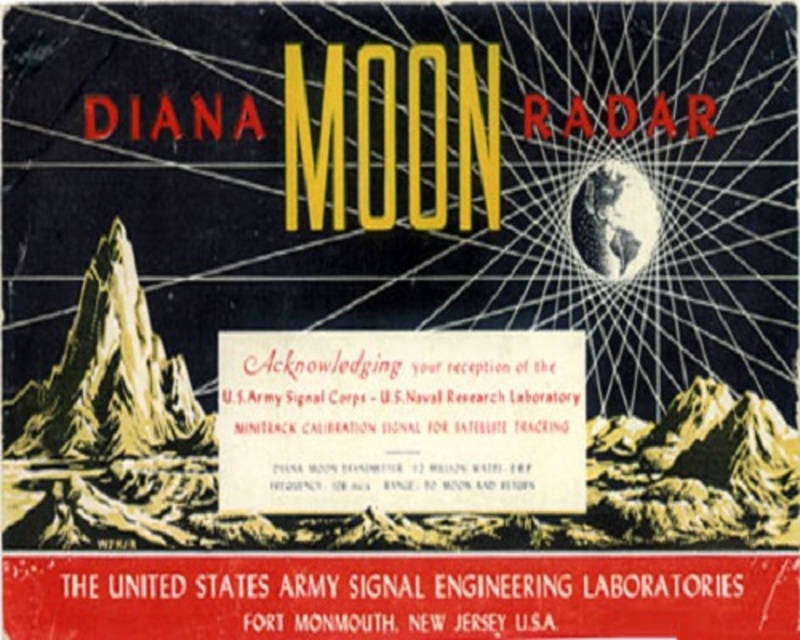 The United States Army was the first to bounce a radio signal off the Moon, and the site is now part of the Information Age Science History Museum and Learning Centre. The historic transmission on January 10 1946 from an Army tracking dish, is the starting point for all moon bounce experiments. 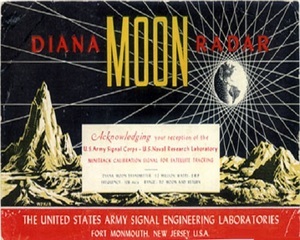 Project Diana, named for the Roman Moon goddess Diana, was an experimental project at Fort Monmouth in New Jersey to bounce radar signals off the Moon and receive the reflected signals. It played a part in the space race, and even those weak signal reflected from the lunar surface are reported to have had experimental applications in spying activities. Those lucky enough to receive the reflected signal received a QSL card. Moon Bounce communication was abandoned by the military to be replaced by communication satellites in the early 1960s. However it found a use in Amateur Radio in the 1960s and with weak signal techniques of today is still being explored throughout the world. The large dish antenna is available to Moon Bounce for radio amateurs. The Ocean Monmouth Amateur Radio Club intends to put a 23cm signal on the dish and celebrate at birth of EME.